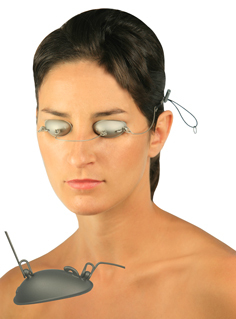 Durette IV (External ocular laser shields) – Oculo-Plastik, Inc.
Durette IV external ocular laser shields. With movable metal nasal and temporals. •Metal cups (regular or small) with metal attachments. •Choice of using temporal pieces or hook for direct attachment of the elastic. 21-555, regular or 21-552, small. 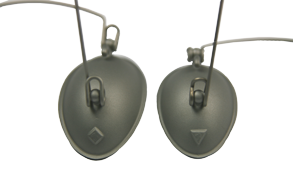 Durette® IV external laser shields, with mobile metal attachments. Includes 1 assembled pair external shields and extras. 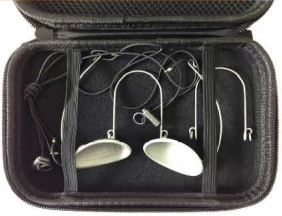 Total parts comprise 2 metal cups, 2 nasal and 2 temporal metal attachments, 2 elastic headbands and the black case. 21-550N Replacement metal attachments, 2 nasals. 21-550T Replacement metal attachments, 2 temporals.